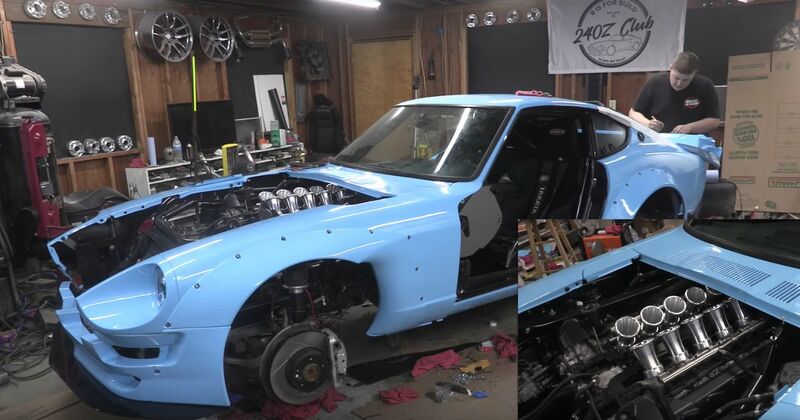 There are so many ways to modify a 240Z. For instance, you could make the most of the stock L24 inline-six. Dropping in a 2JZ of some sort is an option. And yes, many choose to dump a General Motors LS V8 into that iconic Fairlady snout. YouTuber B is for Build, however, went in a very different direction. His 240Z is powered by a BMW M5 ‘S85’ 5.0-litre V10. Oh yes. Not that you’d know it on first inspection: pop the bonnet, and you’re presented with something that really doesn’t look like an engine unleashed upon the world a mere 12 years ago. That’s thanks to the 10 beautiful, gleaming velocity stacks sitting on top of the re-homed engine. The V10 isn’t the only thing pinched from an E60 M5. The car takes almost its entire drivetrain from the BMW, much of the wiring, and even the dashboard. It’s all built around a custom frame, upon which a 240Z body - with a part-Rocket Bunny wide-arch conversion - is mounted. The reborn 240Z sits on air suspension and is finished off nicely with some Konig wheels. As you’d expect, the whole build takes place over many, many YouTube episodes, but since neither Top Gear nor The Grand Tour are on right now, we fully recommend clearing your schedule this weekend for a binge-watch session! Recommended car throttle shop Worldwide Shipping In The CT Shop Car Throttle Submit Your Videos To Get Featured On Our Social Channels Tuning Can A Lightly Tweaked E36 BMW 328i Out-Drag A Hyundai i30 N? Tuning Ken Block's 'Hoonitruck' Has A 900bhp Ford GT Race Car Engine Tuning Dodge Challenger Redeye Tuned Beyond 1000bhp By Hennessey Tuning This 700bhp Subaru WRX Has A 9000rpm Skyline GT-R Drivetrain Tuning You Can't Help But Love A Fiat Cinquecento With A 1400cc Superbike Engine Tuning German Tuner Pumps Aston Martin Vantage Up To 671bhp Tuning This Angry Four-Rotor RX-7 Dyno Run Has A Racing Car Soundtrack Tuning What Is Wheel Offset, And Why Is It Important To Consider?